Leaders from around the world will attend a series of events from April 22 - 24 marking the presentation of the inaugural Aurora Prize for Awakening Humanity. 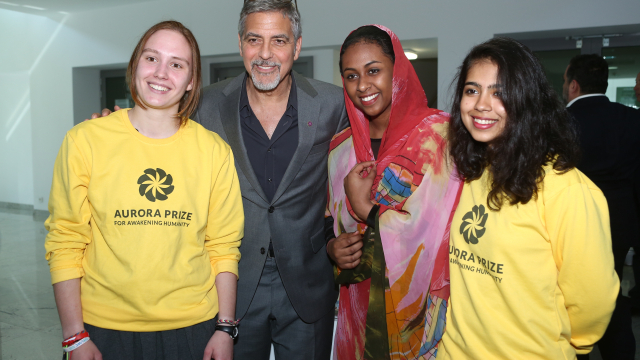 The co-founders of 100 LIVES and the Aurora Prize Selection committee – co-chaired by Nobel Laureate Elie Wiesel and Academy Award-winning actor and humanitarian George Clooney – will honor the Aurora Prize finalists for their exceptional acts of humanity with a weekend of events from April 22 through April 24, 2016. On behalf of the survivors of the Armenian Genocide, and in gratitude to their saviors, the Aurora Prize celebrates the strength of the human spirit that compels action is the face of adversity. The weekend of events, hosted in Yerevan, Armenia, will encourage discussion of some of the most pressing humanitarian issues the world is facing today, and honor those helping to address them. The weekend’s events will culminate in the inaugural Aurora Prize ceremony, honoring four finalists for their exceptional acts of humanity and presenting the final recipient with the award. Download photo Formats Multiples | Qu'est-ce que c'est? jamais votre profile sociale sauf si vous nous en demandez. Pour plus d’information, veuillez revoir nos Condition d’Utilisation et Politique sur la Confidentialité. Cette information est enregistrée pour votre sécurité.